Winter sport Val Gardena - Ortisei, Italy! Skiing and snowboarding in the Dolomites is awesome! The slopes are wide and you can go for long rides before getting back in a lift. The highlight here is the famous Sella Ronda, a circular route of 40 km downhill skiing. We have done it before and we came back for more! With the Sella Ronda you ski around the Sella massif clock- or counterclockwise, one is a bit more difficult. The full round takes a full day but you can also return at a certain point and there are many other areas to explore as well. Sella Ronda tip: Do not go on the sunniest day of the week because this is when most people go. You are likely to queue for the lifts on those days and the slopes get many bumps on the slope (moguls) which makes the tour even more challenging. There are many Alpine huts and mountains restaurants on the slopes and in town. There is not a lot of party going on, you will find mid-range to high-end dining and upscale wine bars with people wearing fancy clothes. We stayed in Ortisei since the town is a bit less expensive that the other towns we checked around the Sella Ronda. 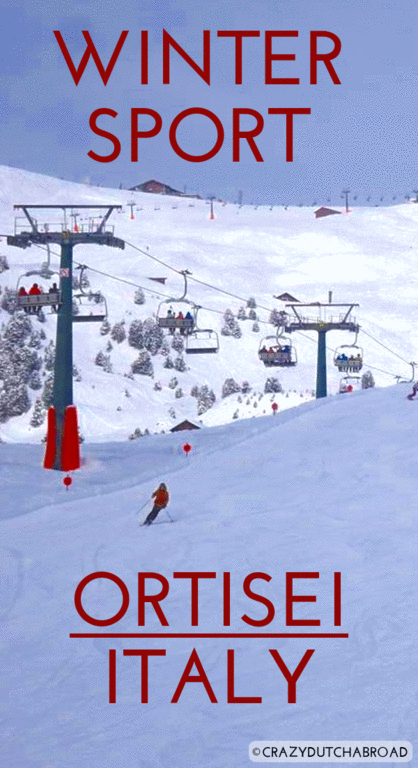 Ortisei is a great place to stay! It offers direct access to two different ski areas by lift. Many fine restaurants and wine bars make this a comfortable town. Since renting equipment can be really expensive close to the ski-lifts we went to Ski Rental Peter in town. His price was a lot cheaper than the others we checked and the quality was good, recommendation! There is not a lot of 'party' going on at the slopes but Baita Cuca Hutte (Santa Cristina) has party music outside and free shots, for as far as that can be the reference. Baita Sanon Hütte (Alpe di Siusi) is my favorite on the Seiser Alm. With every one liter of draft beer you get a small gift, start collecting when you are with friends! You can get there and away by horse carriage with little bells as well. Sanon restaurant / Baita Sanon Hütte. Ortisei is a little bit upscale with fashionable Italian people and well-dressed dogs. Beer comes a wine glass and all drinks are served with delicious Italian finger food, like bruschetta or cold meat on toast. 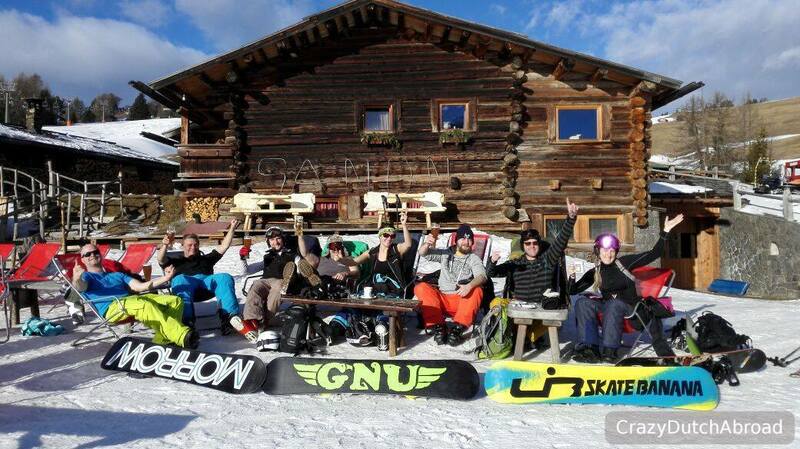 For the people who like the apres-ski party scene Siglu bar, a carousel apres ski bar, is the best option. This is the only bar we found with party music and shots. Vinoteque La Cercia / Cërcia Enoteca. This is a must do in Ortisei! This cozy vine bar serves great wines and local (finger) food. Especially outside with the heaters it is really nice to have a glass of wine. Ristorante Pizzeria Terrazza, a more budget restaurant. Try the entrecote! When you are looking for a place to stay or how to get there know that there are different names for this town: Ortisei, St. Ulrich and Urtijëi. Italian, German and English are well spoken around town but it probably explains the different names. This time we stayed at a group accommodation and rented an extra room to accommodate everybody. Renting a bigger accommodation is nice because you have your own living room, kitchen and washing machine. Residence Albierch is about 10 minutes walking to the first ski-lift at base station and a bit longer with indoor escalators to the other. Residence Albierch, Ortisei. Great for groups! The place we stayed before is also great and offers great breakfast.